Join The Venture Bros. for lunch! Exclusive set includes retro tin tote with Jonas Venture Sr. and Rusty Venture Action Figures! Featured in the episode "Escape to the House of Mummies Part II." Fully articulated, with real fabric clothing and a 1970s retro style. Entertainment Earth Comic-Con Exclusive! This Comic-Con Exclusive features a retro-styled metal tote that measures 8 5/8-inches wide x 6 3/4-inches tall x 4-inches deep, with series-specific artwork that is 100% new and was commissioned by the show's artists, Stephen DeStefano and Liz Artinian. 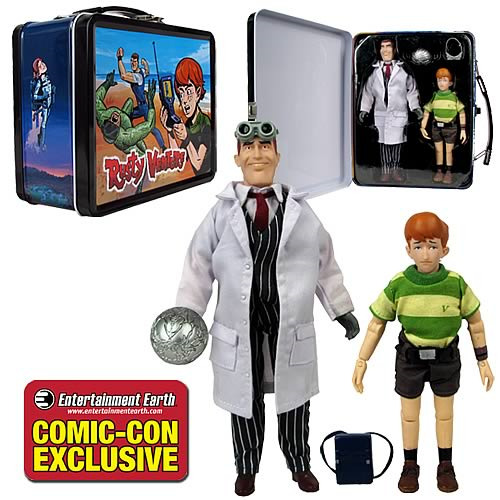 Modeled after Rusty's lunch box from the episode "Escape to the House of Mummies Part II" in Adult Swim's all-the-rage animated series The Venture Bros., it comes packaged with awesome action figures of Jonas Venture Sr. and Rusty Venture. These fully articulated, 8-inch tall figures sport real fabric clothing and a 1970s retro style that accurately portrays that distinctive action-comedy mix that has become synonymous with the TV series. Order this and join The Venture Bros. for lunch every day! Limited edition of 1,500 individually numbered pieces. Presenting Dr. Jonas Venture, Sr., deceased father of Jonas Jr. and Dr. Thaddeus Venture. This super action figure of the famed scientist/adventurer features a removable coat, as well as goggles and ORB accessories that will make him a key member of your Venture Bros. team! With a backpack accessory and a watch accessory to add to his authenticity and appeal, this engaging Rusty Venture Action Figure will win a place in your heart... and your collection. Order him today!